This free service will transport you from your lodging choice, the Amtrak Station or wherever you may be in Winter Park & Fraser to your intended destination. You don't need to guess where the bus is, start seeing it on your mobile device. The Lift Rider app lets you view the real-time location of the bus, get estimated arrival times, and set stop reminders so you never miss the bus. Try the app for yourself on your apple or android device! Riders will only be picked up and dropped off at designated signed stops. Buses will pass anyone standing on the side of the road that is not at a designated signed stop. ADA Paratransit service is available to eligible riders who are unable to reach their nearest designated signed stop by calling 970.726.4163. Click Here to view an example of our bus stop signs. 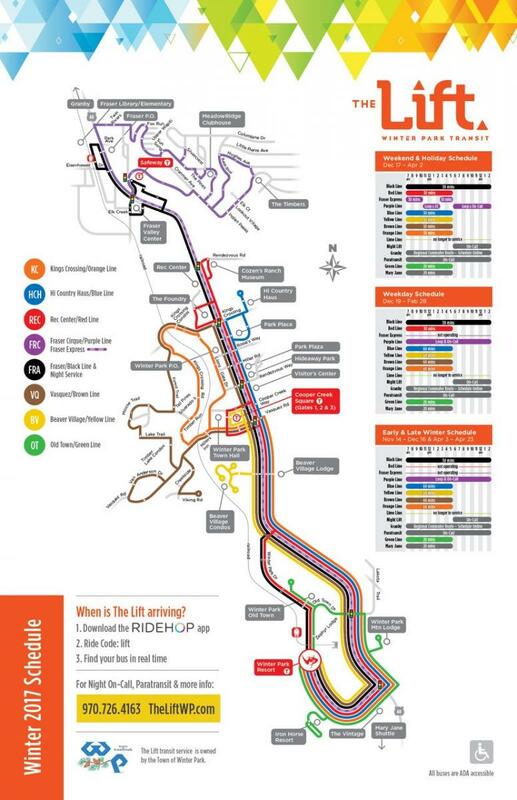 Click here to see more detailed route and schedule information.